Can I enable (if such a feature exists) assisted drawing for Affinity Designer for iPad? I want to be able to use the pencil tool (with Apple Pen), with isometric grid enabled, to draw along the lines of the grid. This will greatly assist me in creating isometric objects. Tried most of the tutorials on https://affinity.serif.com/en-us/tutorials/designer/ipad/ but none seem to cover the topic I am looking for. 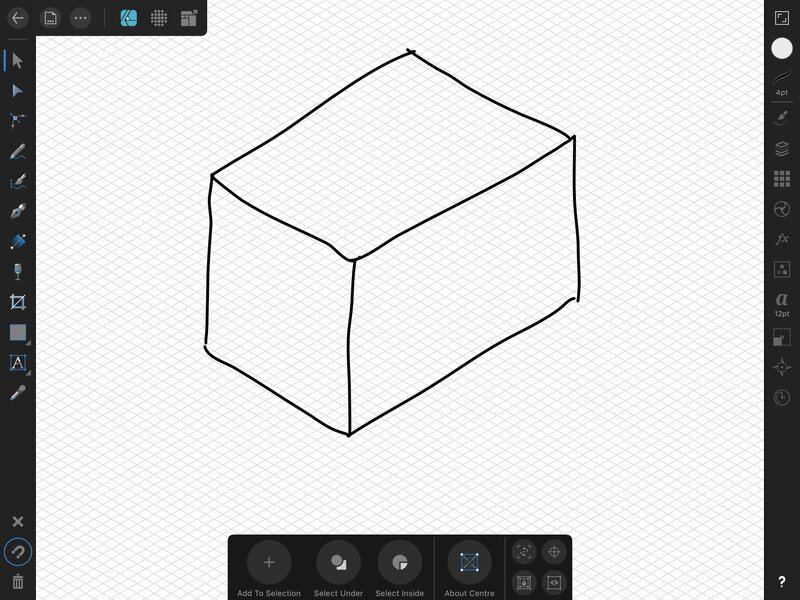 Below is sample of a simple isometric box I am trying to draw. It looks hideous. From your screenshot you already have snapping enabled (the magnet icon on the bottom left of the interface) - adjust its settings accordingly to what you need tapping the document icon on the top left of the interface and selecting Snapping. With this done, use the Pen Tool (not the Pencil Tool as this one is intended for freehand drawing) to tap on the intersections of the grid with the Apple Pencil - you should see a yellow node appearing meaning the point was snapped to the intersection. Continue tapping where you need to complete the drawing. If you make a mistake tap the Edit icon in the context toolbar on bottom and move/adjust the nodes as needed - the snapping will help you position/align the nodes with the grid here too.